Location aliases: Generally referred to by its proper name, Shollenberger Park, or simply referred to as Shollenberger. Older records may refer to this location as the Cader Lane Ponds. Location: Main entrance is at Cader Lane, off of South McDowell Blvd. via Lakeville Highway (Highway 116), in Petaluma. The park may also be accessed from the parking lot of what used to be the Point Reyes Bird Observatory (PRBO) offices (now the Point Blue offices), at 3820 Cypress Dr. (park on the street, not in the parking lot). GPS address: 1700 South McDowell Blvd. Petaluma, CA 94954 should take you to the intersection with Cader Lane; 3820 Cypress Dr. Petaluma, CA 94954 will take you to the Point Blue offices. Access: Free parking at the Cader Lane entrance (small parking lot). On-street parking in front of the Point Blue (formerly PRBO) offices (the Point Blue people request that you do not park in their parking lot. Although the temptation is great, I never do, except on weekends, when the offices are closed). There is a long trail that circles the entirety of Shollenberger Park. The best areas, however, tend to be: 1) between the Cader Ln. entrance and Adobe Creek, and along the trail that runs beside the creek; and 2) the section of trail that runs on a dike directly out from the Point Blue offices, which gives good views of standing open water and marshy flats. The walk between these two areas can be productive when the water is high in the winter months, but it’s faster to drive between them. See Related Bird Watching Spots below for information about Alman Marsh and the Ellis Creek Water Recycling Facility. Restroom facilities: Public restrooms available in the parking lot at the Cader Ln. entrance. Restrooms also available up the road at the parking lot for the Ellis Creek Water Recycling Facility (3882 Cypress Dr. Petaluma, CA 94954; GPS coordinates 38 13 35N, 122 35 8W). See the Ellis Creek page for details. Restaurants nearby: Not a lot in the immediate area of Shollenberger Park. If you're in a hurry, the best bet is probably the Subway close by (2620 Lakeville Highway, Suite 320, Petaluma, CA 94954 -7621 (789-9011). There is a Starbucks at 3100 Lakeville Hwy. (775-3708) for the basics. Otherwise, downtown Petaluma is probably the best bet for lunch. My favorite has long been the Water Street Bistro at 100 Petaluma Blvd. North, Petaluma, CA 94952 (763-9563). Small, but delicious. Lombardi’s Barbecue (3413 Petaluma blvd. North, Petaluma, CA 94952; 773-1271) has excellent sandwiches. Try the pulled pork sandwich. Ask for your cole slaw IN the sandwich. Yum. Nearby attractions: The historic downtown area of Petaluma has restaurants, galleries, antique and other shops, mainly on Kentucky St. and the surrounding areas. Good for a stroll and shopping. This area has some good Victorian architecture. If you’re in the mood for bargain hunting, the Petaluma Village Factory Outlets outside of town may be of interest, at 2200 Petaluma Blvd. North (778-9300). Petaluma has a nice Carnegie Library still in operation that houses a small museum of local interest. (built in 1904; 20 Fourth St., Petaluma, CA 94952). For the gardener, Cottage Gardens is an excellent nursery, at 3995 Emerald Dr., Petaluma, CA 94952 (778-8025). 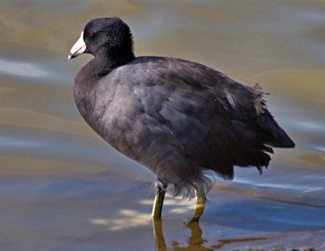 Related bird watching spots: Shollenberger Park is adjacent to the ponds and trails at Ellis Creek Water Recycling Facility, another excellent birding spot (3882 Cypress Dr. Petaluma, CA 94954; GPS coordinates 38 13 35N, 122 35 8W). See the Ellis Creek page for details. On the opposite side of Shollenberger Park is Alman Marsh. 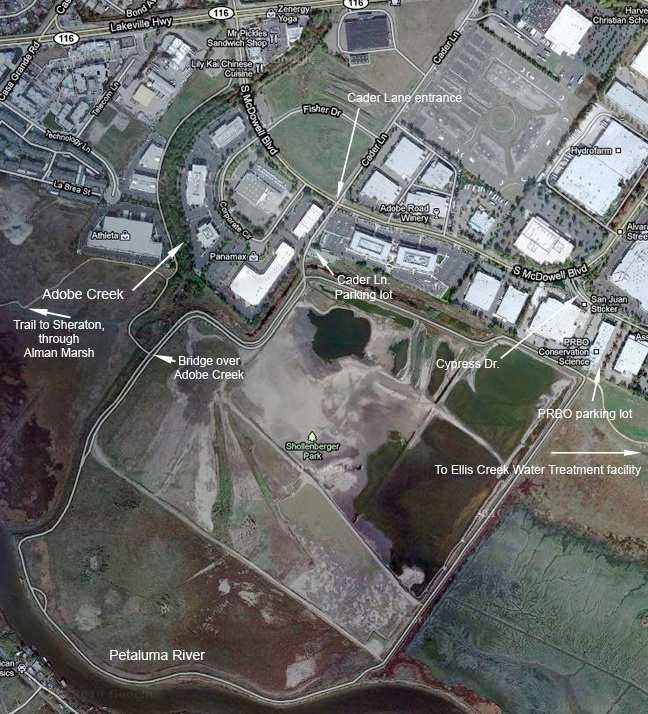 A one-mile trail leads from the bridge over Adobe Creek through marshy areas, terminating at the Sheraton Sonoma County hotel (745 Baywood Dr., at the Petaluma Marina). 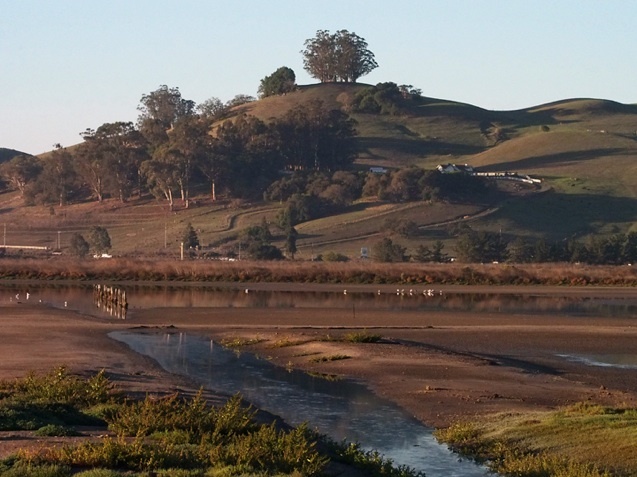 The Petaluma Wetlands Alliance oversees all three areas--Shollenberger Park, the areas around Ellis Creek Water Recycling Facility, and the Alman Marsh area. See the Wetlands Alliance Website for more information. Further afield: Continuing south on Lakeville Hwy/Route 116 from the Shollenberger Park area will bring you to a T-junction at Hwy 37. To the left with the water in front of you (east) is the San Pablo Bay National Wildlife Refuge (mostly in Solano County). To the right, you can head back to Highway 101. The Atherton Rd. 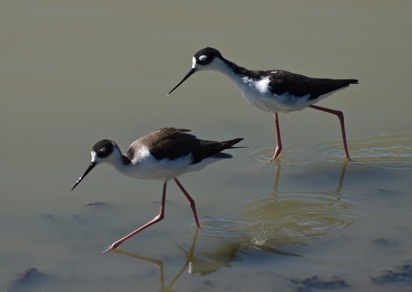 exit gives access to good birding at wetlands accessible from Bahia Dr. (Marin County). Head for the intersection of Bahia Dr. and Topaz Dr. A GPS address of 500 Bahia Dr., Novato CA should get you close. 1600 Armstrong Ave. should take you close to good birding along Binford Rd., on the other side of the same area (heading toward Gnoss Field, a small airport here). Trails connect the two areas. Notes: A new asphalt plant adjacent to Shollenberger Park, which could seriously degrade the location for bird watching and other activities, has been proposed (and opposed). Its future remains unclear. Unless noted, all photos by the author. If you would like to use one of my images, please ask for permission for non-commercial use with proper credit or commercial use with proper compensation.